Happy Friday! 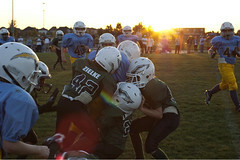 I am sharing a photo from Tuesday's Pee Wee Football game. Eagles vs Chargers. Our Pee Wee Eagles lost but they did put up a tough fight. Here they are seen in the late day sun, taking down a Chargers Player.